Is the big gaping hole in Quincy Center this city’s Filene’s? 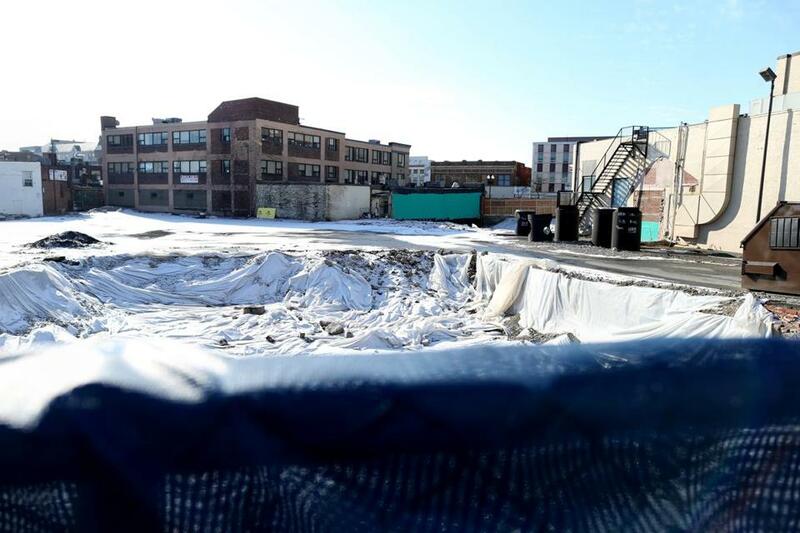 For now, construction has come to a halt on the Merchants Row project in Quincy. QUINCY — Bob Beal is out of the picture. John Fish has stepped aside. Now, chunks of the city have been demolished and construction has stopped, leaving big, gaping holes in the heart of downtown. What has two of Boston’s most successful real estate titans running scared is an ambitious, perhaps overly so, $1.6 billion redevelopment of Quincy Center. The city and master developer Street-Works plan to remake about 80 percent of the downtown over the next decade with apartments, shops, a hotel, and office space. To much fanfare, construction on the first phase, called Merchants Row, started in June, but by November Beal had ended his partnership with Street-Works and Fish was on his way out as general contractor. Officially, Beal left because of his company’s merger with another firm, Related Cos., and with that came a focus on Boston-based projects. But c’mon, Quincy isn’t in the Berkshires. If there was money to be made, any developer worth his Mercedes would have stayed until the bitter end. Quincy Mayor Tom Koch and Street-Works cofounder Ken Narva insist this is not a Filene’s disaster in the making, alluding to when a developer tore up Boston’s Downtown Crossing but then stopped construction because funding froze up in the Great Recession. That project stalled for five years as Boston Mayor Tom Menino waged a war with Vornado Realty Trust executives. At least in Quincy, everyone is still talking to one another and trying to make it work. And when Beal left, another company, Twining Properties, stepped in immediately as a partner. The main problem is that Merchants Row, where apartments, shops, and a garage are planned, came in way over budget at $170 million instead of $150 million. The numbers were off because as the economy improved, construction prices rose and the real estate market changed. That left Quincy with Boston-high construction costs, but without the ability to collect Boston-size rents. Quincy Mutual Group, an insurance company based here since 1851, has sunk about $20 million into the project. The company wants to keep investing, but the first phase’s economics don’t make sense. To rein in costs, Merchants Row is being downsized into a six-story building from 15, some nonunion labor may be used, and the city may give up some benefits it had negotiated with the developer. Fish has a unique perspective. He is general contractor for the Filene’s site, now being developed by Millennium Partners into a 60-story tower. He believes the long delay made the Boston project stronger because it caught a better market cycle. It’s a different story in Quincy. “Time has been their enemy,” he said. For decades, there has been talk of redeveloping downtown Quincy, once dubbed “Shopperstown, USA,” where in the ’50s department stores like Sears lined Hancock Street. But as people flocked to the suburbs and malls followed them, main streets like Quincy’s began to wither. The city inked its deal with Street-Works in 2010, just as the country was coming out of a downturn. It’s a bold move — one that has left the downtown looking like one giant construction zone. Shovels are unlikely to return until next year. This mayor isn’t going for the easy money and courting a billion-dollar casino, which his counterparts are doing in Everett and Revere. But old-fashioned economic development can also be a high-risk bet. Shirley Leung is a Globe columnist. She can be reached at sleung@globe.com. Follow her on Twitter @leung.